I'm quite stunned by the mud slinging that goes on within the United States Evangelical movement. It runs like a cancer within Christianity. Everyone, from the very top leadership to the lower echelons, bloggers, and local congregations... well, it seems to be a problem on all levels. Whether on blogs, on Youtube, at my home church, or talking to friends.. someone always has something negative to say about a leader, or a movement, or a theological issue. And very often nothing to say if they think that person is doing a good job. Why is it that we can only say something if it's negative? Is rebuking the only language the church may speak to and regarding one another? It's quite upsetting to see such a petty problem. My first reaction is to think my goodness, can we grow up? Have we forgotten our primary purpose of knowing Jesus Christ and making him known? John MacArthur is one of the worst with this, I've seen him come at Mark Driscoll calling for his resignation. He did the same thing to Rick Warren. I see an incredible amount of fire come at just Driscoll and Warren. It's systemic. I was at a presentation at a local church a few months ago watching an open air preacher call apologetics worthless. I've seen apologists mock presuppositionalists. At the Strange Fire conference cessationist calvinists mocked charismatics, and later on I saw Mark Driscoll show up at the conference to mock the cessationists. John MacArthur called the NIV a heresy, while my text book for Inductive Bible Study said formal translations are not accurate. I've seen John Piper interview Mark Driscoll, Francis Chan, and Rick Warren, and find very little wrong theologically in their views. What about unity within the body of Christ? I love John MacArthur, he is one of the greatest expository preachers the world has ever seen. I love Mark Driscoll, his ministry to guys in their twenties is incredible. I love Rick Warren, he's attacking some the biggest issues our planet faces. I love the body of Christ, because you're my family. And not because that's what I'm suppose to say, or it's kinda true because the Bible says it, or even that it's definitely true but I don't actually feel it, it's that it's completely true, and I do feel it. You are my family, actually, and truly, if you're a Christian. That is the happy fact. My spiritual gifts are "showing mercy" and "exhortation" so maybe I'm just better at picking out the things to love in people. But how can we be missing this one? Show love. Show more love. Any given situation, love. And more love. Romans 16:17-18 (ESV) I appeal to you, brothers, to watch out for those who cause divisions and create obstacles contrary to the doctrine that you have been taught; avoid them. For such persons do not serve our Lord Christ, but their own appetites, and by smooth talk and flattery they deceive the hearts of the naive. Fortunately my friends, my family, this is not a difficult problem to solve within Christianity. Start blogging about unity! Project a positive mindset into the body, and a lot of the divides can be healed. It's as simple as people swallowing their pride and choosing to magnify the good about others, rather than focus on the bad. We can learn to love anyone. And Jesus said love your enemies, and pray for those who persecute you. Christianity in the United States is under organized attack, vicious attack daily in the colleges, in the classrooms, at the bars, the clubs, on the internet, and in people's homes. We don't have the luxury of going to war with each other every time we find a disagreement in theology. If we both love Jesus Christ and match our truth from the Bible, we're on the same team! The problem here is that we're forgetting to love one another. We're favoring doctrinal disagreements and failing to love. May I share chapter 13 of 1 Corinthians? Jesus said Love God and love your neighbors. Let's do that. Blog about unity. Christianity is under enough fire without various sects within Protestantism taking pot shots at one another. Unity, unity. I suggest a new rule, for every 1 time you rebuke another Christian brother or sister, you must first encourage 10 others. 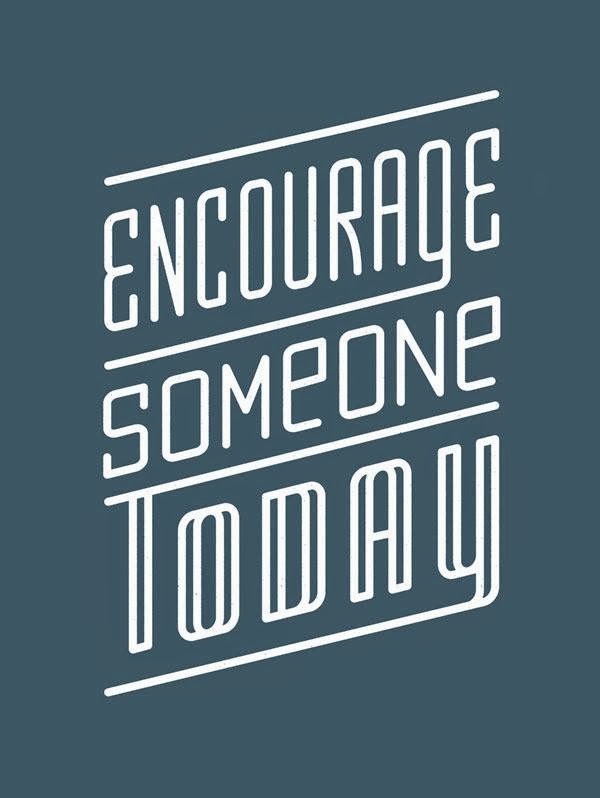 Encouragement is sorely lacking in the body today, and especially in the pulpit. Too many are rebuking, too few encouraging. So show your family some encouragement. Hebrews 10:23-25 (ESV) Let us hold fast the confession of our hope without wavering, for he who promised is faithful. And let us consider how to stir up one another to love and good works, not neglecting to meet together, as is the habit of some, but encouraging one another, and all the more as you see the Day drawing near.